George Gakis… a name that pretty much everyone who is into the hard rock sound is familiar with since the early ‘90s when he first made his appearance. His name is synonymous to well played, emotional, old school hard rock and apparently over the years his skills have developed and progressed. His vocals are passionate and a bit hoarse with a bluesy touch, as is his music which is often enriched with blues touches. Naturally “Too Much Ain’t Never Enough” has both hard rock anthems with sing along choruses and emotional ballads dealing with love issues. 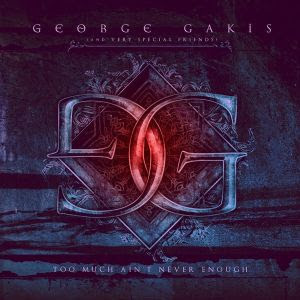 If, by any chance, this review is read by someone not familiar with George Gakis I think I should mention that musically he sounds close to WHITESNAKE mainly, but also has references to bands like THUNDER and DOKKEN. This doesn’t mean that he doesn’t have his own sound, he does and his vocals are also another point that makes his music stand out. The production here is top notch and crystal clear with the necessary volume and power and the CD is accompanied by a DVD containing video clips of five of the songs appearing here. Moreover, this CD features some great guest musicians or very special friends as Gakis likes to call them and more specifically I’m referring to Joe Lynn Turner, Bobby Rondinelli, Hames Kottak, Greg Smith, Yiannis Spathas and Mark Cross. For the end I left what I personally found the most impressive part of this album… the bonus track “Mi Me Koitas” which is a cover of a Greek traditional song from Epirus. I was stunned and it’s a tune that will keep me company from now on… a song that everyone should listen to cause it shows how well different musical genres can be married together. “Mi Me Koitas” is a real gem and I just can’t stop spinning it! Αναρτήθηκε από Nick Parastatidis στις 7:15 π.μ.